Ask any nature lover to recommend a place to go for a day ramble in Tasmania and the Blue Tiers of Northeastern Tasmania may not be the first place mentioned, if it is even mentioned at all. But really, enough of Cradle Mountain and Mt Field already. Enter the Blue Tiers, one of Tasmania’s best kept secrets. Whether it be for the specific pursuit of plants or for a general nature walk, this blog cannot live up to it’s purpose if I do not dedicate at least one post to the Blue Tiers. My love affair with the Blue Tiers began in 2007 when I was doing an honours project, studying the bryophyte diversity of rainforest in the Northeast. The Blue Tiers was one of the sites I visited in the Northeast. I was smitten with the place on the very first visit and I knew it would be the locality of repeated botanical and spiritual pilgrimages for me. This post takes a journey from the base of the Blue Tiers to the summit of Mt Michael. 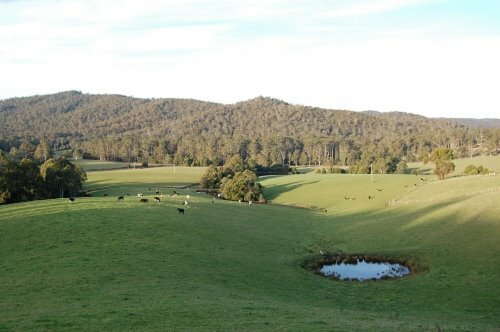 Getting to the Blue Tiers is a roughly 4 hour drive from Hobart up the Midlands highway and via St. Helens. From St Helens we head toward the Tasman highway and turn into Lottah Road. Just on this drive along Lottah Road alone there will be much botanical and scenic delights. To start with at the base of the Blue Tiers, Lottah Road runs alongside the Ransom River, which is flanked by one of the healthiest populations of the Southern Kingfern (Todea barbata) I have ever seen, with magnificent White Gums (Eucalyptus viminalis) towering over them. The King ferns belong to the Osmundaceae, a primitive lineage of ferns by fern evolutionary standards. The petrified fossil trunks of the relatives of Todea are world reknown (see my post on Osmundaceae fossils) and observing these King ferns at the edges of the Ransom River, it is not difficult to appreciate the environmental conditions that makes such a process of preservation possible. As we press on along the road toward Lottah there are stretches of idyllic paddocks with scattered copses of stately eucalypts, all possibly remnants of the settlement that used to exist there in the early 1900’s. 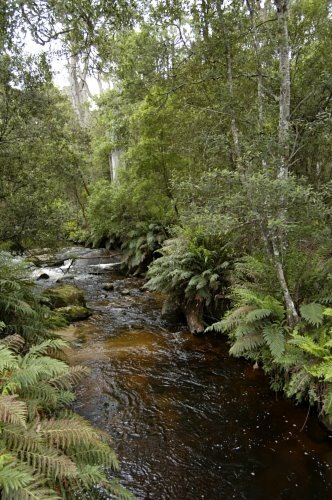 The scenery changes naring Poimena, when one drives through Mountain Ash forest encountering a veritable fern paradise, with a preponderance of Soft treeferns (Dicksonia antarctica) and other understorey ferns lining the well maintained gravel road. Finally, nearing Poimena, the eucalypts give out to stunted Myrtle Beech rainforest, which has every bit the evocative beauty of the grandiose cathedral rainforests typical of the Northwest, except stature. The Sun Flats area is an ideal place to park to hike up toward Mt Michael. 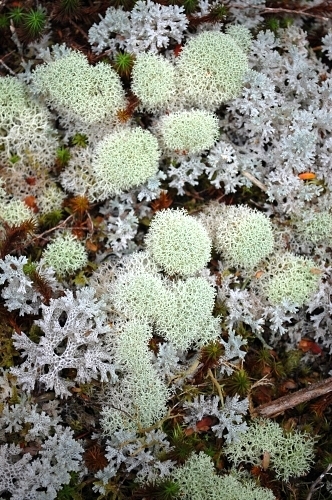 Upon embarking on the trail, one enters the magical subalpine landscape of the Blue Tiers, a veritable a haven for lichens. 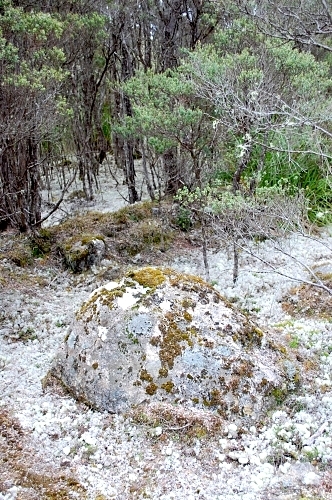 The understorey of the subalpine heath is teeming in mats of Coral lichen (Cladia retipora) and Reindeer lichen (Cladina confusa), in some parts looking like snow patches. Just as haunting in beauty are the Wooly teatree (Leptospermum lanigerum) wetlands, with some of the most luxurant Sphagnum bogs of the Northeast. 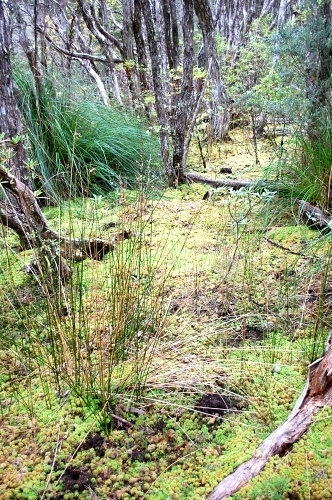 This is also a site where one can expect to find some rare and interesting bryophytes that inhabit these bogs. Soon however, one enters the abode of the grand cathedral myrtle beech rainforest where scarcely a log goes uncovered with verdant mats of mosses and liverworts. It was in such a site that I toiled in the sublime pursuit of bryophytes. Amazingly, every time I visit the place I add to my checklist some species I did not see prior, despite what I would consider to be a rather comprehensive inventory. 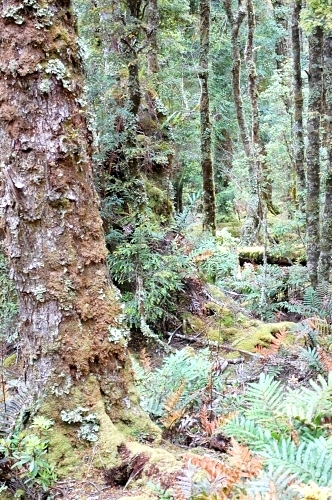 The transition from stunted Myrtle Beech rainforest around Poimena to cathedral rainforest at a higher altitude around Little Mt Michael may seem quixotic but is likely related to the history of tin mining that the Blue Tiers has encountered. 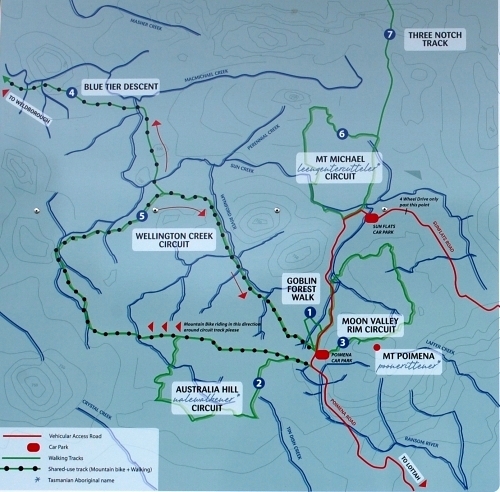 The information boards at Poimena and the Blue Tiers website gives very comprehensive information on this. At some point, a large part of the Blue Tiers must have been cleared. Yet the cover of the vegetation that is observable today exemplifies the tremendous regenerative capacity of the landscape. 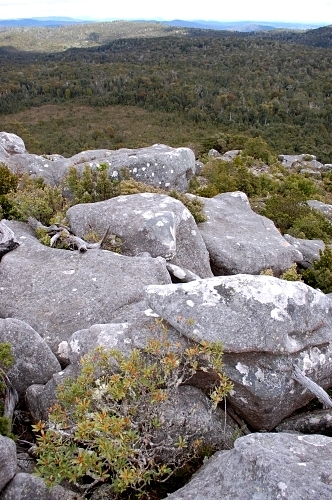 The rainforest soon gives way to the rocky granitic summit of Mt Michael. The panoramic views of the surrounding Northeastern highlands are absolutely breathtaking. At an altitude of 800m or so, the botany of the summit has strong subalpine flavor, with a number of significant endemic plants like the Cheeseberry (Cyathodes glauca) and Mountain Geebung (Persoonia gunnii). Some rainforest elements like the Celerytop Pine (Phyllocladus aspleniifolius) are also present. The hike from the Sun Flats carpark to the Mt Michael summit is an easy one, taking at the very most an hour and a half at a very leisurely pace. Yet in this meagre time spent in the Blue Tiers, it is impossible remain untouched by it’s beauty, and it’s resilience. The Forestry Tasmania information board at Poimena recognizes the Tasmanian aborigines as the custodians of the land and add that ‘the spirit of the Trouwunna clanspeople always remains in this land’. I believe that the land HAS a spirit, even long before the aborigines came along. It is a spirit that, no doubt, the aborigines added to in the collective time during which they inhabited the land. Imagine now, what WE can add, in a spirit of earnest appreciation. 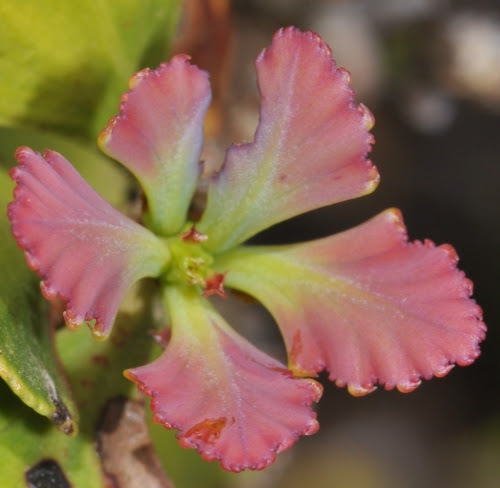 This entry was posted in Fieldtrips, Parks and Nature Reserves and tagged Blue Tiers, Bryophytes, Cladia retipora, Cladina confusa, cool temperate rain, cool temperate rainforest, lotic wetlands, Mt. Michael, rainforest, sphagnum bogs, subalpine heath, Todea barbata. Bookmark the permalink.